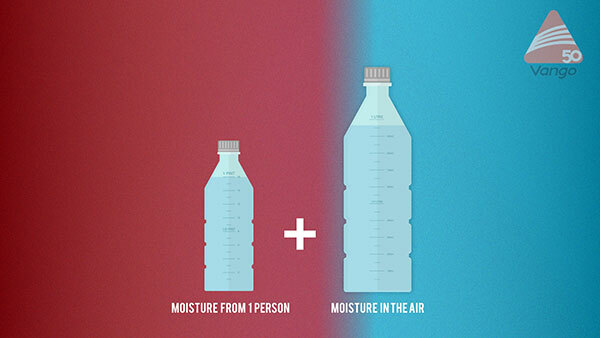 Condensation in tents can happen to the most experienced campers. Have you woken up with moisture on the inside of your flysheet, or a pool of water in your tent? You would be forgiven for thinking that your tent has leaked during the night, but what has probably occurred is condensation, and it can put a real dampener on your camping trip. In this article we are going to take a look at why it occurs, and what steps you can take to prevent tent condensation forming. Has my tent leaked, or is it condensation? If you have been unlucky enough to find water in your tent, it is very unlikely that your tent has leaked. Vango tents are made to the highest specification using quality materials and components. From tough, waterproof fabrics to strong stitching techniques and sealed seams, your tent is designed to keep the weather out. How much condensation can form in a tent? What causes condensation in tents? 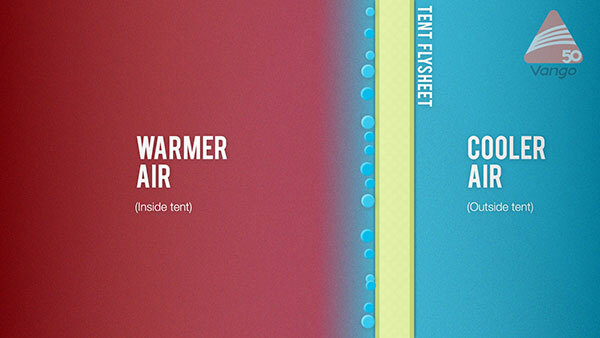 Air temperature in the tent can become warm and humid from people, heaters and a lack of ventilation. When the warm air inside the tent hits the relatively cool fabric of the tent, the moisture condenses into liquid form. Do all tents suffer from condensation? Tents designed with good ventilation and an inner tent will fair best. In certain weather conditions, the design of any tent can be overwhelmed by moisture. For example, if it is a cold night and there is no breeze to circulate the warm, moist air out of the tent, condensation is likely to form. The air, as held within the beams of a Vango AirBeam tent, circulates within the beams. If the outside temperature is much cooler than that inside the tent, then the cooling of the air in the beams is quite quick. The warm, humid air inside the tent then condensates onto the area of the beams inside the tent. This moisture can then appear as water droplets on the AirBeams and in some cases may create pools of water at the base of the AirBeams. If the prevailing conditions are particularly prone to condensation, remove items from around the base of beams. What weather conditions can make condensation worse? Condensation can be made worse when the air outside the tent is significantly cooler than inside, especially after a warm, humid day. On days where there is a substantial temperature drop, it can be challenging to prevent tent condensation forming. Rainy conditions can also increase the chances of condensation occurring, often leading to the appearance of a leaking tent. Rain water on the outside of the tent, or rain water evaporating off the outer surface of the tent causes the temperature of the fabric to decrease, leading to more rapid condensation as the air inside the tent comes into contact with it. My tent is wet from condensation, what should I do? Wiping the walls with a towel or cloth is a good way to remove condensation from the surface and stop any drips. On polycotton, avoid pressing against the sides of the tents as this can cause water to seep through. If you are staying in one location, remove all wet items from the tent and dry them so that they don’t create more moisture the next night. Dry and ventilate your tent as best as you can. Tents can be slow to dry on cold mornings. If you are trekking, you may wish to pack your tent and dry it out properly in the midday sun. How can you prevent condensation in your tent? Here are our top tips for a dry night! The most effective way to prevent condensation is to ventilate your tent and reduce the internal humidity of your tent by promoting a good airflow. Examine your tent for low and high venting options and open them to let the moist air flow out. If the weather conditions permit, leave the upper and lower sections of the door open, mesh sections can be kept fully zipped. If appropriate, also ensure vents at the rear of the tent are fully open. Make sure the vents are not obstructed by bags, or sleeping bodies. Towels, boots, waterproofs, swimming trunks, sweaty friends… keep that soggy, wet stuff out of the tent. Use an awning, tarp or hub to provide storage for wet kit. If pressure is applied to the tent walls of a polycotton tent, water may seep through. Keep bags and other items away from tent walls and be mindful that condensation can collect at the foot of AirBeams. Primarily for safety, but cooking also releases large amounts of moisture into the air. Remember that extractor fan in the kitchen at home? Further warming the air inside the tent will increase water vapour in the air as warm air can support more moisture (our techy guys talk about dew points and percentage humidty), plus the warmer the tent is the more moisture will be released into the tent through evaporation and perspiration. Instead of heating the tent, warm yourself up with the right clothing and good sleeping bags. Sheltered areas are more prone to generating condensation. Pitch your tent so that vents are lined up with the prevailing winds. Rivers and lakes can increase humidity. Pitching your tent a little further away from water sources can help reduce condensation. In some weather conditions condensation is difficult to avoid. Reduce it using the steps above and pack a spare towel to simply wipe it away. I never realised that one person could produce so much moisture. That explains the damp sheets! We wiIll make sure the ventilation windows are all open as they are not there for nothing! Family Festive Gifting with Vango!